Manchester United are reportedly interested in West Ham forward Marko Arnautovic, but a future transfer may hinge on Jose Mourinho’s future at Old Trafford. 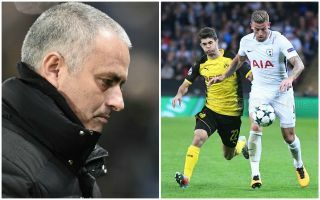 Over the weekend, Arnautovic was linked as a £50million target for United boss Mourinho by the Daily Mirror, and there’s been another update on a potential move for the Hammers ace. While the Red Devils could make a move for the 29-year-old, it seems most likely that a deal would have to wait until the summer, and it’s suggested it probably wouldn’t happen at all unless Mourinho remains as manager, according to the Telegraph. In truth, many United fans probably aren’t too excited about this potential swoop, with Arnautovic not exactly the calibre of player they’ll feel they should be pursuing. While the Austria international has shone in the Premier League during his time with Stoke City and West Ham, he doesn’t really stand out as a player who’d fit in at a big six club. And if the Mirror’s claim that they may have to pay around £50m for him is correct, that surely isn’t something that could be considered good value for money given his age as well as his career to date.